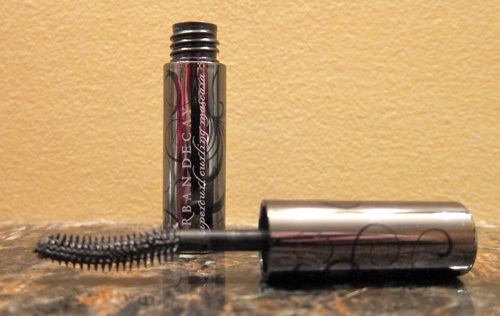 THE SKINNY: Urban Decay's Supercurl Curling Mascara is a pretty, shiny mascara that goes on thick and lasts all day. It didn't do anything to curl my lashes, but it's still a decent mascara. Clumps that appear as the mascara ages aren't any worse than any other brand and seem to comb out of my lashes easily. My only real complaint is that this mascara is hard to get off. You really need to scrub with face cleanser or use a makeup remover. If I didn't give my lashes a good cleaning, they felt hard the next day and the mascara will clump up in those spots. It's a lot of work for everyday lashes. My usual makeup routine really isn't this dramatic. KEEP OR TOSS: Keep, but given the difficulty in removing this mascara I'll reserve it for special events, when I need thick, glossy lashes. CHECK IT OUT: Supercurl Curling Mascara only comes in one shade -- black.